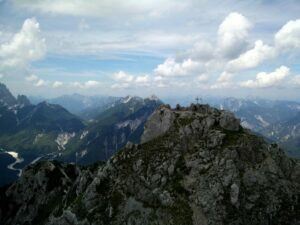 After climbing Jof di Miezegnot from Valbruna village, I stayed the night in Tarvisio in order to climb the the 2074 meters high Cima del Cacciatore mountain with my girlfriend next day. I choose Cima del Cacciatore because the trail seemed less physically demanding than trails to other mountains of the similar height. 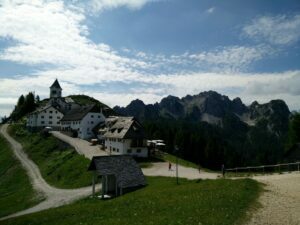 Furthermore, you can start the hike from the rather famous and popular Monte Lussari (1743 m) nearby – which you can reach easily by a suspended cable car/aerial tramway in the vicinity of Tarvisio. We went by the cable car to Monte Lussari as the Jof di Miezegnot hike the day was quite exhausting, but the mountain top can also be ascended on foot for those who want to do a longer and more demanding hiking trip. The trail goes just under the cable cars installation and ascends steeply from 816 meters above the sea level to 1743 meters above the sea level. 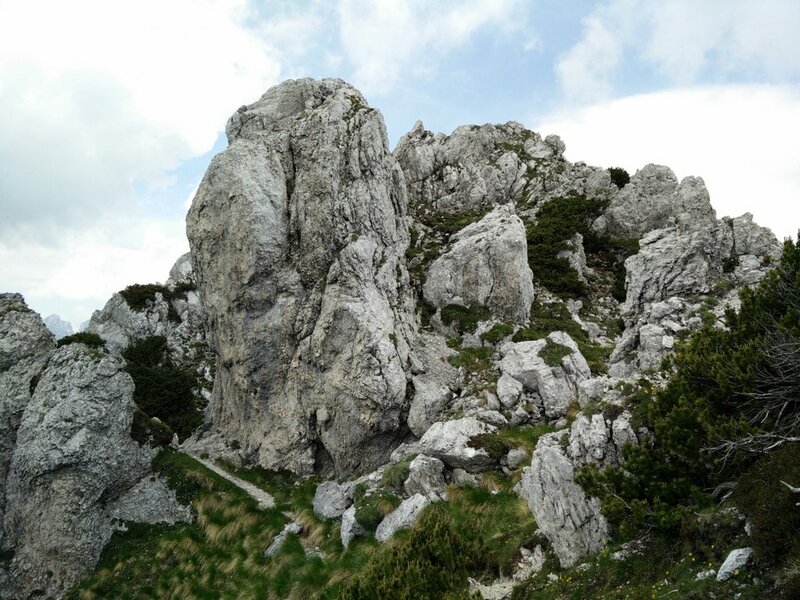 Even though the trail from Monte Lussari to Cima del Cacciatore is not very demanding physically it requires good hiking/mountaineering skills as it crosses some very exposed and steep areas on the way to the top. Naturally, sure-footedness and lack of vertigo is also required. If you decide to explore this trail in winter, early spring or late fall where it is likely to be covered with snow you will probably need winter equipment such as ice axe(s), crampons and gaiters in order to safely ascent the summit. The trail starts on Monte Lussari which can be reached by cable car from the outskirts of Tarvisio (Ski Area Tarvisio). 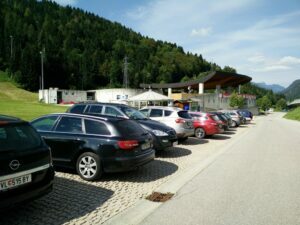 Tarvisio is very easy to reach by car as it lies next to the A23 highway which connects Italy with Austria. To reach the cable car station at Ski Area Tarvisio you should drive along the A23 highway (Italy) or A2 expressway (Austria) between Villach and Udine until you reach the Tarvisio exit. Then take the Tarvisio exit and if you are coming from the south (Italian side) turn right in the first crossroad. Then drive towards Tarvisio but only for 1.2 kilometers – here you will see the Ski Area Tarvisio on your right. Turn right in the crossroad and park the car on the parking place in front of the cable car station (free of charge). If you are coming from the north (Austrian side) you should take the first Tarvisio exit on the way and then continue through the town towards west. After couple kilometers you will come to a roundabout where you should take the second exit. Then continue towards west and soon after you go past the Eurospar grocery turn left. This road will lead you directly to the Ski Resort Tarvisio. When you are off the expressway, you can also navigate after the small brown signs with Monte Lussari and an icon of a cable car on them. If you have a GPS device you can use the 46.5066, 13.5368 coordinates in order to reach the parking place at Ski Resort Tarvisio. If you don’t have a car, the best way to reach the cable car station at the foot of Monte Lussari is to go by bus to the nearby bus stops Camporosso Via Valcanale (650 meters away) or Camporosso Via Alpi Giulie Dawit (950 meters away). There is actually also a busstop exactly at the cable car station called Camporosso Telecabina, but it seems to have very few departures. If you get off at Camporosso Via Valcanale, you should walk towards east for 350 meters and then turn right on the first road possible. This road runs towards southwest and crosses under the highway; thereafter it turns east and just past the cable car station. The bus stop Camporosso Via Alpi Giulie Dawit is located east of the cable car station and thus you just need to walk west along highway SS13 for 450 meters and then turn left off the highway in order to follow the road called Monte Lussari which runs parallel with the highway just below it. This road runs just past the cable car station. At the cable car station you can buy a return ticket for 14 € ($ 16). The cable cars operate from 9 am to 5:15 pm except on Sundays and holidays when they operate from 8:30 am to 6:15 pm. Be sure, however, to check the schedule when you arrive. 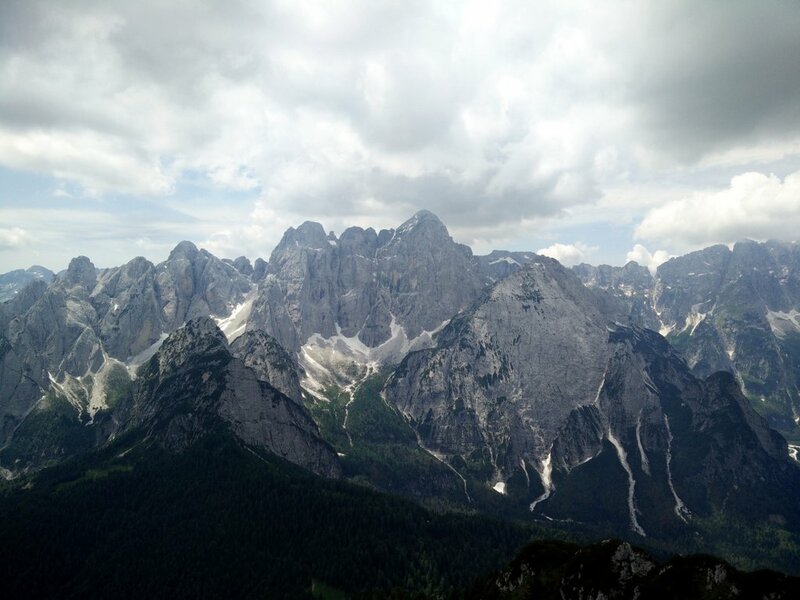 The drive up to Monte Lussari and its famous sanctuary will take you approximately 15 minutes, so you have time to enjoy the view of the Tarvisio valley and the peaks surrounding it. The above attached GPS route starts at the cable car station on Monte Lussari. 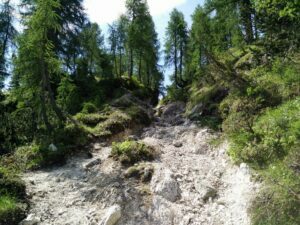 If you want to hike up Monte Lussari, follow the trail that goes under the cable cars installation. I estimate that it would take approximately 2 hours to reach Monte Lussari on foot from the parking place. From the cable car station on Monte Lussari start walking towards the village. 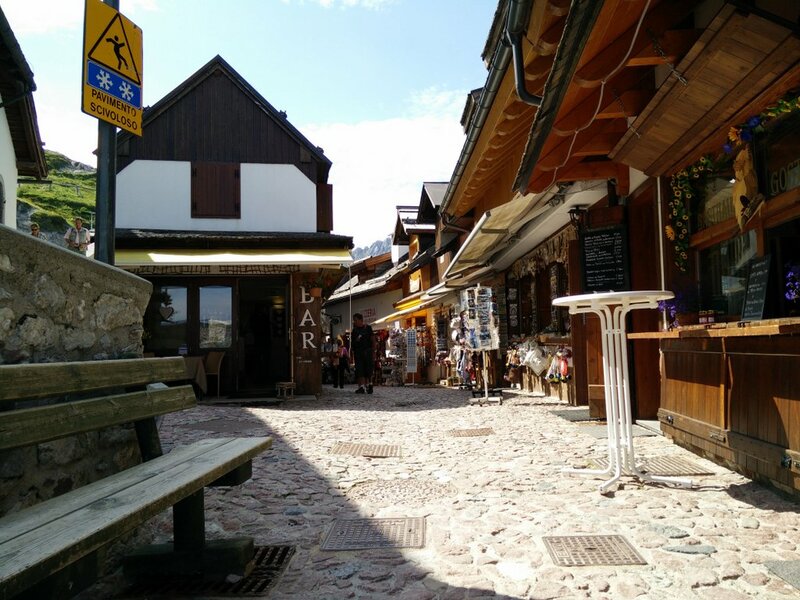 In the village there are many restaurants, gift shops and even accommodation facilities. Go through the village, past the small chapel and soon you will reach a crossroad where the main gravel road starts descending down to the valley. 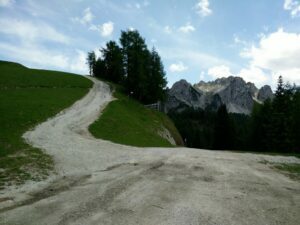 Here you should go left (the main road goes straight ahead) on the gravel road that runs uphill and after walking on it for only 10 meters you should go right on a narrower path where also the direction sign for Cima del Cacciatore is. Alternatively, you can also continue on the main road straight ahead but make sure that you don’t go left in the next crossroad where a small chapel stands, as this this road goes down to the valley. 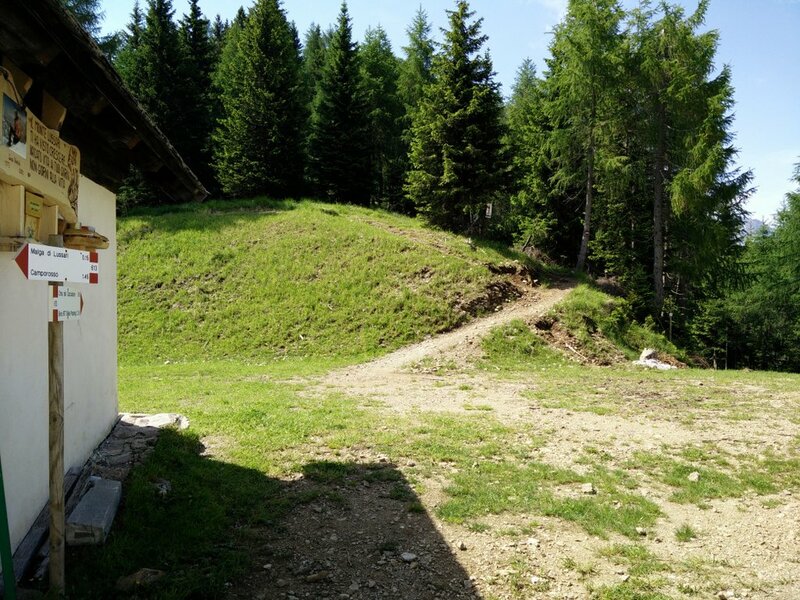 Here you should continue on the narrow path behind the chapel – there is also a directions sign towards Cima del Cacciatore next to the chapel. From here on, the trail runs through sparse woods and ascends gently. The scenery is green and luscious – you almost feel like walking through the movie set of Sound of Music! After walking for approximately 1 kilometer the terrain will become more rocky and in front of you, you will see a ridge with several peaks. Continue on the path for approximately 400 meters more and then you will reach large scree (loose stones that cover a slope) underneath the ridge. We, however, decided to climb the scree straight up rather than using the longer path. Some scrambling was required to ascend the scree as it got quite steep on some stretches. After climbing the scree we again reached the “official” trail. Caution is required while walking on this part of the trail as the path runs directly beneath the ridge – which occasionally has stones of varying sizes rolling down. You should also be on the lookout for the Alpine Chamois roaming around the mountain ridges in this region – not just to enjoy the sight of this agile little mountain goat, but also because they will often send off a multitude of small stones rolling your way if you get too close. We did indeed spot one, but it quickly climbed out of sight. 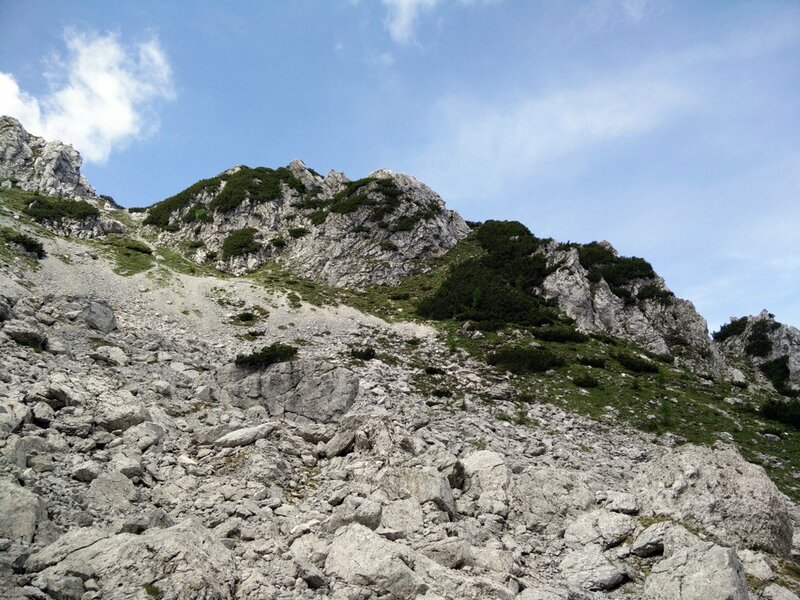 After coming back on the path we continued towards north-east and first ascended another peak with approximately same height as Cima del Cacciatore. We then traversed the ridge towards west for approximately 200 meters until we reached Cima del Cacciatore, which is marked with an iron cross and a bell. 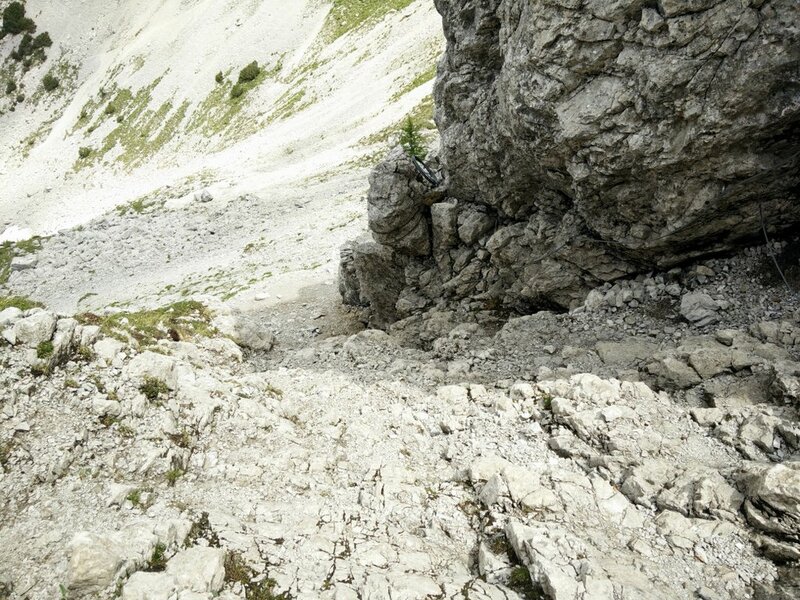 However, the traversing here is technically challenging and the path very exposed. Great caution is required here as a fall may result in serious injuries. 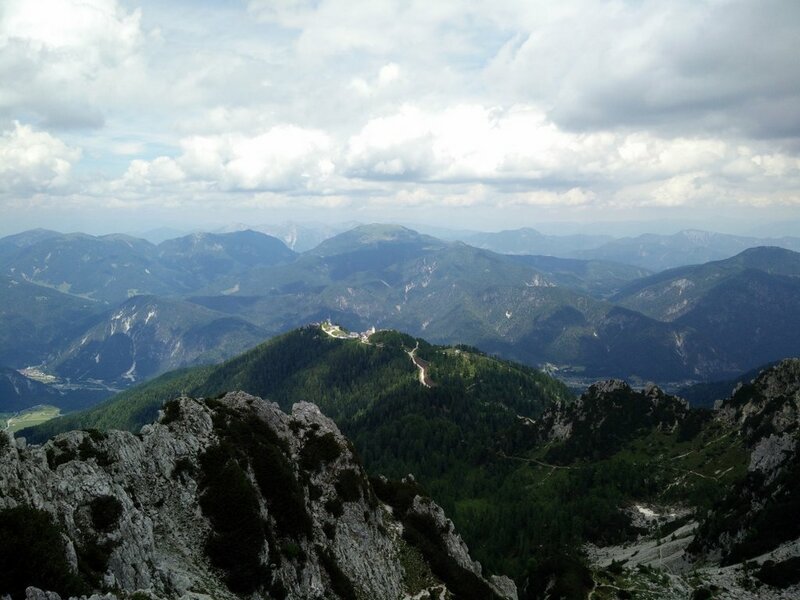 On top of the mountain you will get a great a great view on the surrounding peaks in Julian Alps from here – including a view on the famous 2754 meters high Jof di Montasio. You can write yourself into the visitor’s book which you will find in a metal box next to the iron cross. Rather than traversing the ridge again, we decided to descend the mountain by a secured path that runs through the groove slightly to the east from the peak. The secured path is very steep but as a steel cable runs along it, you should not have too much trouble with the descent. At the end of the secured path we came back on the path running beneath the ridge, but descended the scree by following the path instead of going directly down. From here on we continued back to Monte Lussari more or less on the same path as used for going out. On this hike my girlfriend was testing the Asics Fit-Sana Contour Tank while I was wearing an Icebreaker Tech T Lite Merino wool t-shirt, Montane Terra Pack pants, Salewa Mountain Trainer Mid hiking boots, Woolx Merino Boxers, baseball cap and socks made of Coolmax fibers. 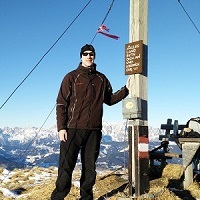 I was satisfied with all of the equipment but especially with the Salewa Mountain Trainer Mid hiking boots that provided me with great stability, grip and ankle support on the higher rocky terrain where scrambling was required. In the Osprey Talon 44 backpack I was carrying rain jacket, fleece jacket, sun cream, food, water and some accessories. If you are doing this hike in winter, early spring or late fall you will probably also need ice axe(s), crampons and gaiters as the trail will be covered with snow. 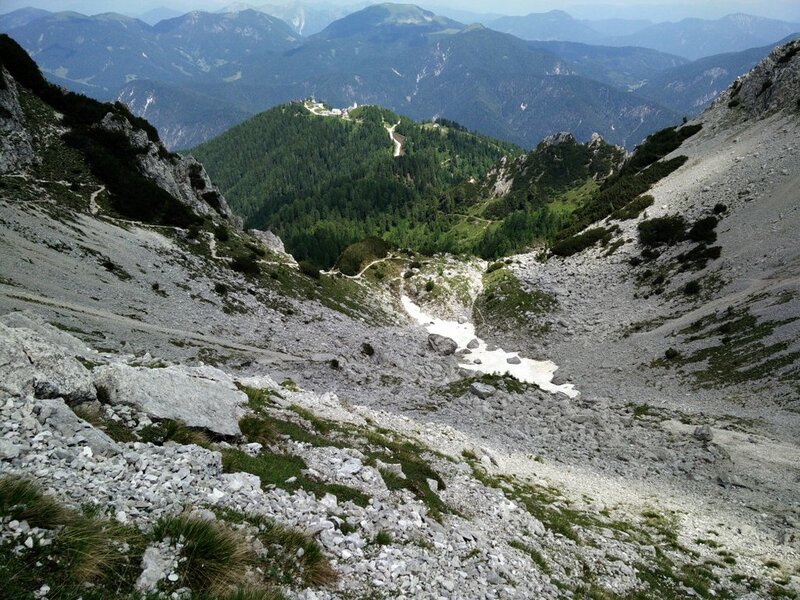 Even in June there was still some snow on the slopes of the mountain – but not on the trail itself. 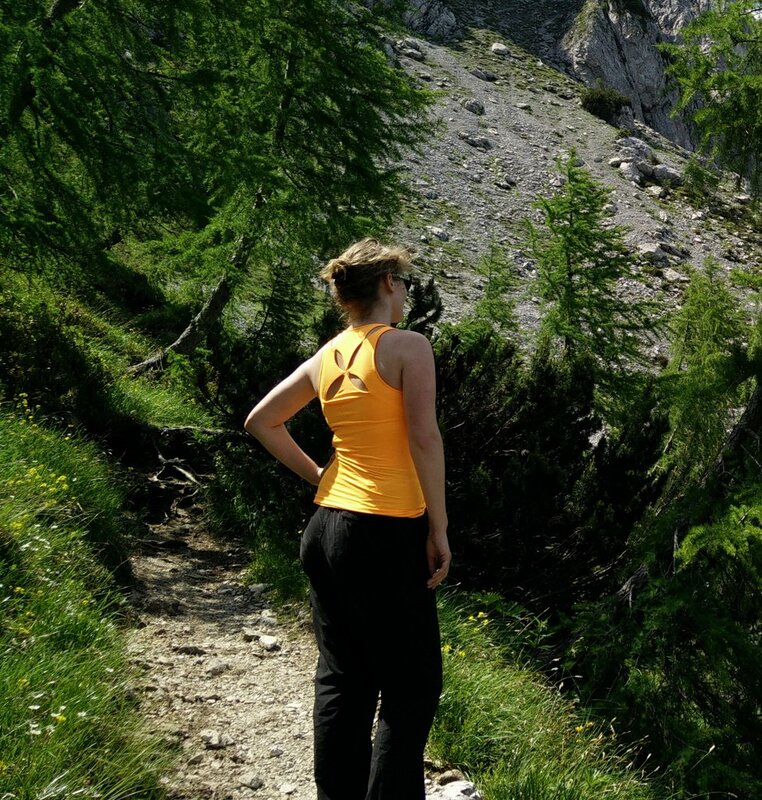 The Asics Fit-Sana Contour Tank has a built-in bra and offers low to medium support which was exactly right for this hike which included some scrambling as well. The fabric – which is a mix of polyester and spandex felt very comfortable against my skin with no rubbing or chafing and dried very fast (in sunny and slightly windy weather) whenever we made a longer stop. The cut-outs on the back also gave good ventilation, while those in the front are more for show. 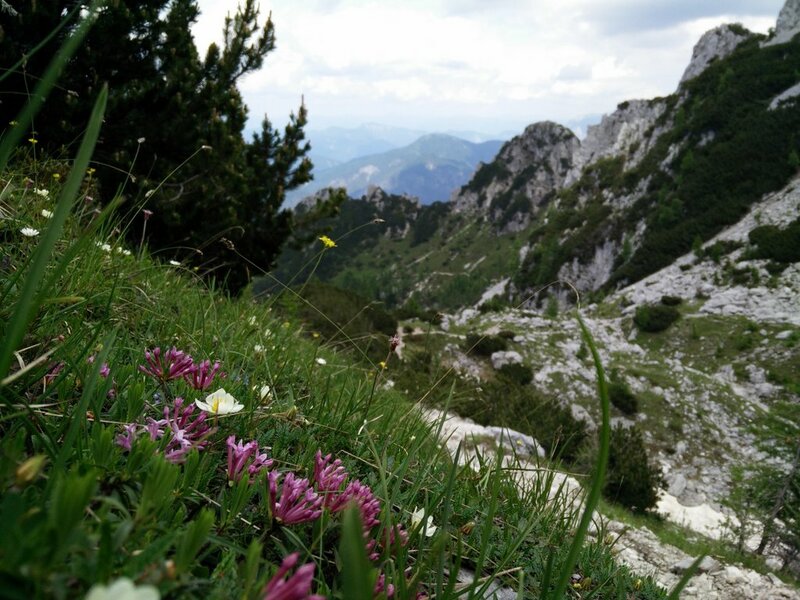 The Cime del Cacciatore trail is best for those who already have some hiking and mountaineering experience but want to do a physically less demanding hike – maybe to restore or reserve strenght for more demanding trails in the area. You should also be comfortable with heights as the last part of the trail crosses quite some exposed areas. On the top of the mountain you will be rewarded with a great view on the surrounding peaks in the Julian Alps. I also recommend stopping in the village on Monte Lussari on the way back for lunch – you can get a great lunch there for as little as 7 € ($ 8). We went to the one at the highest altitude to enjoy the view from the open terrace. 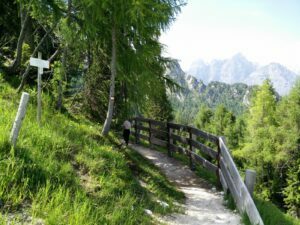 While you will see a lot of people of all ages in the village on top of Monte Lussari and on the lush green paths in its vicinity, you will have the more rocky parts almost to yourself. 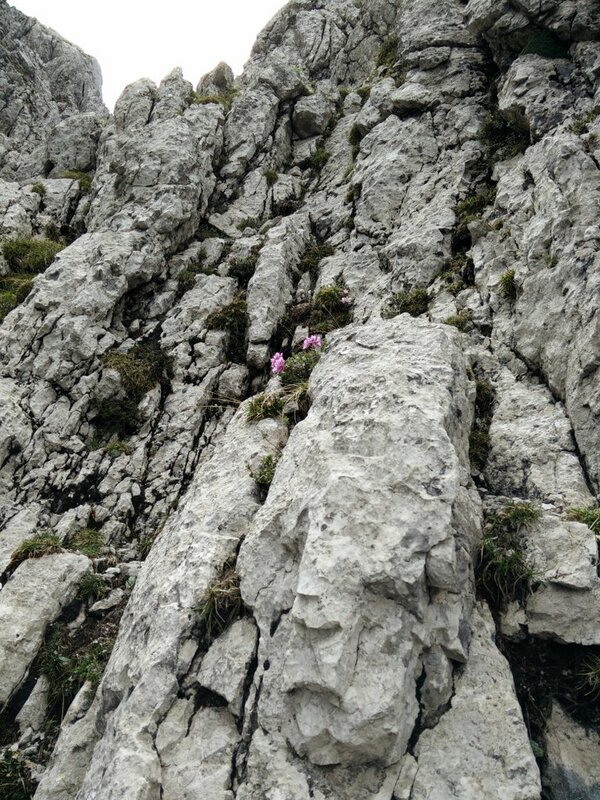 Although coming in the beginning of the summer season, we only met one other person on the top of Cime del Cacciatore and a small group at the scree below. If you have any questions about this hike, please drop me a line in the comments below. How to re-waterproof your rain jacket and other rainwear?